A hydrogel contact lens could help prevent blindness by stopping corneal melting. 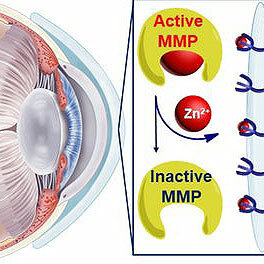 Corneal melting, which can be caused by disease, burns or some eye surgeries, causes the cornea to melt due to the overproduction of zinc-dependent enzymes called matrix metalloproteinases (MMPs). To help treat this condition, the team from the University of New Hampshire is developing a contact lens that incorporates a hydrogel containing a compound that binds with zinc ions. In tests, the hydrogel contact was able to remove the zinc ions and deactivate the MMP enzymes, without affecting the tissues in the rest of the body.